Learn something new from my Photo Tips, the tips will not only cover the use of Photoshop, but also include using your camera and photographic philosophy. Imagine being able to photograph what you want when you want with only yourself to please. Added to this, if the light isn’t right on the day or if you decide the subject is not what you want to photograph after all – you can just walk away. These are the advantages of being an amateur photographer when photography is for pure pleasure and for your own satisfaction. Because amateur photographers get a lot of enjoyment from their hobby it becomes a natural aspiration to want to earn their living from it and turn professional. Let me very quickly say that the difference between an amateur and professional photographer is not down to the quality of their work – there are many amateur photographers who consistently produce high quality images which outshine that of a professional photographer. The difference is that a professional photographer produces images to please someone else, the client, and runs a business to earning a living from photography. As a professional photographer the business side takes over and becomes the most important aspect – the majority of photographers are self-employed and therefore responsible for running their own business. If you are just relying on your talent as a photographer to earn a living at it; chances are you will very quickly fail. You will be more likely to succeed if you have a strong business acumen and learn just enough photographic skills to get by with in your chosen field. Please don’t think I am trying to discourage anyone from wanting to become a professional photographer as what can be more satisfying than earning a living from a job you really enjoy. However, it does need treating with a sense of reality and if photography ends up as a hobby rather than a career it is possible to argue that an amateur has a better outlook towards photography as they do it because they love it rather than because they get paid for it! Bridge often remains an undiscovered application with most users of Photoshop. Available with Photoshop CS2 onwards, it is installed automatically and can be accessed, with PC platforms, via Start > All Programmes > Adobe Bridge or by clicking on the Br icon along the menu bar in Photoshop (CS5). Bridge is an advanced file browser with the added advantage of being able to preview all of your images – including RAW and PSD files without the need to open them. This can save a lot of time – especially if you have a large quantity of images to search through. It also enables you to instantly view the Meta data to allow you to check camera information and exposure details. Added to this it is possible to rate images using the star system and run a batch of images as a slide show. Try it when you next use Photoshop and it will revolutionize the way you browse and organize your images. Have you ever been in the situation where you are trying to do something in Photoshop and find yourself needing some assistance? Then help is always at hand via Photoshop’s Help function. 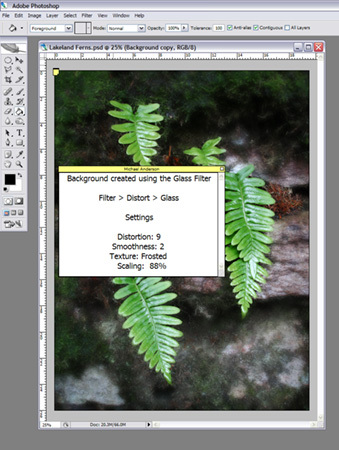 Photoshop’s Help provides a comprehensive guide to Photoshop’s features and also includes tutorials and "how to" tips. To access the Help go to: Help > Photoshop Help or in Windows the shortcut to it is F1. You can then look for what you want in the table of contents, index or by typing a keyword into the search box. When do you delete the image files from your memory cards? If it is after you have just transferred them to your computer – you might even tick a “Delete images from card when transferred” option in the transfer dialogue box. Have you considered what would happen if the files did not transfer correctly or if there was a subsequent problem with your computer – you could end up loosing all of these images. Once you have confirmed that the files open and they have been backed-up – then they can be deleted from the card. By doing this if the files do not transfer correctly or your computer fails: you have either the files on the original card or the back-up to fall back on. Quite often, in images that have been digitally captured, the greens can look oversaturated which makes them look unnatural – this effect can be exaggerated when the image is printed. A quick and easy way to correct this in Photoshop is to make an adjustment using Hue/Saturation – ideally as an Adjustment layer. To do this click on the Create a new adjustment layer in the layers pallet, the icon looks like a diagonally split black and white circle, and select Hue/Saturation from the menu. When the Hue / Saturation dialog box is first opened you will find that the Edit is set to Master and when the Saturation Slider is moved, the intensity of all the colours will increase or decrease. However, it is also possible to change the colours individually. This is simply done by clicking on the Edit drop down box and changing the setting from Master to Yellow – note that to reduce the green in and image it is necessary to reduce the yellow. Now reduce the saturation by moving the saturation slider to the left until the desired effect is achieved. This method will give you total control over how your greens are rendered which will enable you to produce more natural looking images. In this digital imaging age where virtually anything is possible and anything goes, a lot of photographers are still adverse to image manipulation. They cite any form of manipulation as cheating and that everything should be done “in camera”. Up to a point this way of thinking can be understood and respected as it leads to a very disciplined way of image capture. However, after this stage it does limit the photographer in the way the final image looks in print or when projected. With the image captured “as it was” and even if the conditions and light were perfect, it is normally always the case that the image can still be visually improved even if only the simple procedures of cropping, not all images suit the 3:2 or 4:3 ratio that most cameras give and can look stronger as a panoramic or square image, and dodging and burning, where areas of the image are selectively lightened and darkened to guide and hold the viewers eye. These techniques have been used since the birth of photography and are not new to the digital age. Therefore, most images will benefit from even just a small amount of manipulation: but, in reality, it is a matter for the individual photographer to decide how much manipulation is needed depending on what type of image he or she wishes to create. When going out taking pictures, do you go burdened down with all your kit? Although it can be good to have a wide range of equipment to choose from when out in the field, sometimes it can get to the point where it can slow you down and interfere with the picture taking process. If you are going out with certain images in mind, why not jus take the equipment you are likely to need. Having a limited choice of camera or lens to use will focus your attention on the subject and enable you to be more spontaneous towards it. Henri Cartier Bresson, the famous French photographer, took most of his images with a simple Leica rangefinder camera and a 50mm lens. This would allow him to walk the streets of Paris unobtrusively and unnoticed looking for his "decisive moment". Thinking along these lines might help you to decide if you really need that new lens or other kit you think you need as, if you are unlikely to take it with you, it will probably be the case that you don't actually need it! The answer to the question as to when it is necessary to use a lens hood is a simple one – ALWAYS. A lens hood will improve the quality of your images by reducing the effect of flare. Flare can come in two forms. The obvious one is when shooting into the light and the flare is visible in the form of circular patterns running away from the light source – normally the sun. Note that if the light source is within the image frame it is unlikely that the lens hood will stop the flare. Even when not shooting into the light, indirect light hitting the front of the lens will dramatically reduce the contrast of an image and a lens hood will prevent this from happening. As well as stopping flare, the use of a lens hood will: shade the front element of the lens from rain when shooting in inclement weather and also help prevent damage to the front of the lens if it is accidentally knocked. In conjunction with a lens hood a Skylight / UV filter is also recommended to protect the front element of the lens. Therefore the humble lens hood should be regarded as one of the most important items in your photographic kit. Are you still looking for the ultimate camera, lens or accessory that will transform your images and turn them into the ones you drool over in the magazines? “If only I had a Canon 1Ds MkIII with a 24mm f1.4 L lens”, then my images will be as good as the landscape photographs spread over the pages of the photography magazines, many photographers think to themselves. So you start saving and while you are saving it will give you a chance to think of what you are going to tell your wife when she finds out how much this new kit cost - if she ever does! The day comes when the new kit arrives and you go off to the local beauty spot to capture some images. You rush back home, full of excitement, and download your latest masterpieces onto your computer preparing yourself to be gazing at images similar to the ones you had been looking at in the magazines a few weeks before – only to find out that your latest images look no different to the ones you have been taking before. What has happened – is the equipment faulty? Armed with the same amount of photographic knowledge, the new kit is not what it takes to produce better images. If you want to take better images then an increased knowledge is what it takes to do this – with more knowledge will come the realization that less kit is actually needed! Knowing the best time of day and choosing a day when the lighting conditions are going to be right for a landscape are more important than having the best camera – when the conditions are right a compact will be good enough. It is easy to get preoccupied into thinking that to improve your photography you need to buy something when, in reality, more knowledge is needed. Therefore by investing in knowledge, which can come from: enrolling on a course, one to one tuition, or disciplined self- teaching, is the ultimate accessory you can have to improve your photography. As well as magnifying the image, a telephoto lens will also magnify any signs of camera shake. I have seen a lot of potentially good images, taken with a telephoto lens which has been hand held, which are unusable because they display signs of camera shake. The way to avoid this is to use a shutter speed, when hand holding a camera, of at least 1/125s or a shutter speed equal to the focal length of the lens – which ever is the greater. i.e. 1/125s with a 50mm lens and 1/300s with a 300mm lens etc. Lenses and cameras which offer the advantage of image stabilization will allow a slower shutter speed to be used. However, it will be necessary to experiment to see how much the shutter speed can be reduced. I’m not normally one who buys an array of photographic gadgets and accessories as most of them turn out to appear more useful than they actually are in practice, and in the end rarely get used. However I found an exception to this rule in the form of a Gorillapod. It can be used instead of a conventional tripod, but it is small and light and can be easily slipped into most camera bags. It will not fully take the place of a tripod, being much shorter, but it can be stood on something to get more height or, because the legs can be bent into any position, it is possible to attach it to trees, railings or posts to give a secure mounting for your camera. It can also be used in confined spaces and low to the ground where it will be difficult to use a normal tripod. Once you have used one it will probable be an accessory you will not want to be without. Is it worth upgrading your current version of Photoshop as soon as the latest one comes out? With a new version of Photoshop being released about every 18 months, it is becoming an expensive option to keep constantly upgrading. Although the new versions offer more features it is a case of deciding if these will be of benefit. In reality Photoshop 7, which came out in 2002, will offer all the features that are likely to be used on a regular basis. And apart from Adobe Camera RAW (ACR) successive versions only offered a few extra benefits that might or might not be useful. 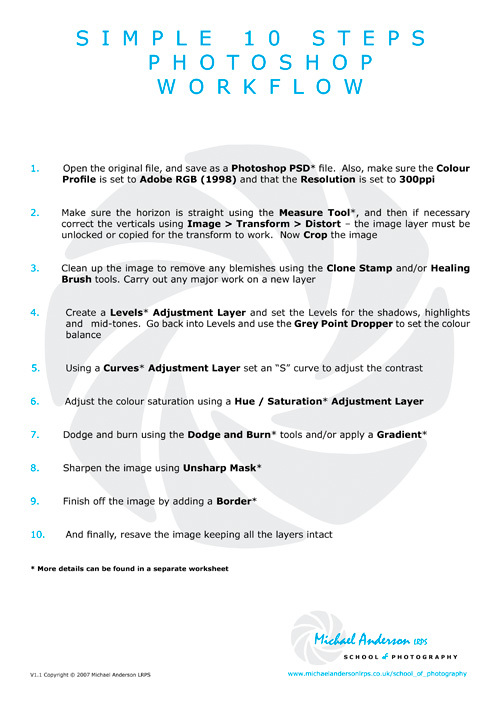 Most of the features listed above will enable the photographer, or image maker, to carry out tasks that would have been virtually impossible in previous versions which make upgrading to Photoshop CS5 well worth considering. I always like to refer to a photograph as an image. Rather than using the word “photograph” or “picture”, I feel that image is a better term. The word image comes from the word imagine and therefore rather than taking a photograph which could be described as a record of what was there, an image describes how the photographer imagined it to be and thus added his or her interpretation to the scene. Especially with the advent of digital photography and the control that is available, it is much easier to create a style that can be instantly recognizable as your own and thus stamping your own mark on what you have created. What do you do with your images once they have been taken and edited in Photoshop – do they end up just sitting in a folder on your computer? If this is the case, why not look at how they can be used and displayed. With modern digital printing methods it is quite easy, and relatively inexpensive, to have them reproduced as canvas prints on in other styles for display in your home or office. Other ways your images can be used are in photo books – the process of choosing the images, deciding on the running order, layout and perhaps adding a few words will help you improve your visual awareness and get you thinking about what you are trying to say with your photography. A simpler alternative would be to have them reproduced as greeting cards which can be sent to family and friends. Why not give one or some of these ideas a go as, not only will it give your photography more direction, it will give you the satisfaction of being able to enjoy the results. Whether you are just starting out in photography or have some understanding, it is essential to have a direction. Rather than just meandering about, a sense of direction will give your photography more meaning and should help you improve along the way. If you are a beginner, why not enroll on a course? If there is not one close by or it is not convenient, then the Open University offers an online course to teach you the basics T189 Digital Photography. Once you have mastered these, you could consider joining your local Camera Club or becoming a member of the Royal Photographic Society and going for a distinction. What ever path you choose having a direction will make your photography more satisfying and rewarding. One of the most important stages of the photographic process, and often the most overlooked, is the process of selection. With the advent of digital photography it is easy to take hundreds if not thousands of images. But what thought is given to going through them all to select the best? Rather than selecting a few obvious ones, it is better to have a process where all the images are looked at and evaluated. This should include selecting the best version of similar images and, if telling a story or producing a panel, select the ones that as a group will convey the message. During this process consideration should also be made to cropping as this simple procedure can transform an image, for example: cropping down unnecessary sky and foreground in a landscape to turning it into a striking panoramic. Once this selection process has been done, the images can be processed in Photoshop with the knowledge that the best ones are being worked on. Soft-Proofing is a facility in the full version of Photoshop which allows the simulation on screen of what the printed version of the image is likely to look like. It should therefore be part the Colour Management workflow. To get the best out of the Soft-Proofing it is important to have a calibrated monitor and the ICC Profile for the printer, ink and paper that is going to be used to produce the print. If the print is going to be produced by a photographic laboratory they will be able to supply the ICC Profile they use to enable you to Soft-Proof the image before it is sent away for printing. Even with a calibrated monitor the image will always look different to the printed version because the monitor image is produced by transmitted light and the print viewed by reflected light. What Soft Proofing will do is to try and address this difference. The time to Soft Proof is when the image has been processed in Photoshop, but before it is printed. If Gamut Warning is ticked from the View Menu a warning will be displayed for the colours that are out of range for the printer. These colours will be corrected by the chosen Rendering Intent – also see note below. Once OK is clicked the image displayed on the monitor will take on the appearance of the printed version. If the image is acceptable then the image can go to print, otherwise further adjustments in Photoshop are needed. If comparing the printed image to the monitor, it is important that the light source to view the print is either true daylight, a daylight bulb or daylight corrected light source. If the print is viewed under an uncorrected tungsten light or fluorescent light source the colour balance of the print will be affected and a direct compassion cannot be made. The Rendering Intent will tell the printer, via Photoshop, how to reproduce the out of gamut colours. These are certain colours the monitor can display but beyond the range that can be reproduced by the printer. There are four rendering intents to choose from but only Perceptual and Relative Colorimetric are suitable for photographic use. The recommended one to use for most situations is Perceptual – unless following any manufacturer’s instructions on using their profiles, in which case, use the Rendering Intent advised. Black Point Compensation will tell Photoshop how to re-align the blacks between different colour spaces and profiles. There are no set rules on its use but, it is generally accepted, is best to leave it unticked unless following any specific instructions, or if converting from RGB to CMYK colour spaces. Whether you are using a Digital Compact Camera to record family, friends and holidays or you are an experienced photographer wanting a small camera for convenience. It is worth following a few guide lines to help you get the best from it. Therefore as long as you do not need to take pictures in low light, of distant subjects or fast moving subjects then a Digital Compact Camera is capable of producing excellent results. Because a Digital Compact Camera has a smaller sensor than a DSLR the image quality will not be as good. However this does not mean they cannot produce good photographs as, good photographs are about visual effect rather than image quality. If your photographic knowledge is limited it will be better to avoid the more advanced settings and let the camera do the work; because in most situations the camera will be able interpret the situation. However in certain situations having a little knowledge can enable you to take good images in situations where the camera can be fooled. Photoshop is a complex application and there are often several ways to achieve the same process. This can make it difficult for the beginner as after a while it all starts to become confusing. Therefore when starting out it is better to learn a few simple steps that are likely to be used repeatedly – this repetition will also help to reinforce the understanding. And once confidence is gained, then go on to learn a few more advanced techniques which might not be used as often. In reality if you do not want to carry out a lot of manipulation to an image, and I have found that a lot of people don’t, then the above processes should cover most of what is needed. Even using Unsharp Mask, or any of the other sharpening filters, it is impossible to make an unsharp image sharp. What the filters will do is improve the definition of an already sharp image - to give it an extra edge. Therefore take care in capturing an image to ensure it is going to be sharp. Not only can incorrect focusing cause blurred images, so can subject movement and camera shake. Once the highlight details have been lost it is impossible to get them back. Therefore if the scene contains very bright areas or has a wide contrast it will be necessary to underexpose. See my May 2008 Monthly Photo Tip. There was a time when all 35mm SLRs came with a 50mm prime standard lens, now a zoom is the norm. Although a zoom can be versatile and convenient, it can make you lazy as it is all too easy to take a picture from the spot where the subject is first seen and then use the zoom so it fills the frame. With a prime standard lens you have to move about to frame the subject, which encourages you to explore the situation – to get the very best composition. Added to this these lenses are more compact, have a faster aperture and can produce sharper images. Why not give one a try! Don’t be confused by the word colour as the Curves have the same effect as the Photoshop version. The main difference is: rather than being able to pull on the Curve’s line in the graph directly, the Curves are adjusted by a series of sliders. Although the adjustment is not as intuitive, is soon becomes easy with practice. Confused by the term Bit Depth? An image file can have a bit depth of either 8 or 16. If you are capturing your images as a JPEG, then you are limited to just 8 bit. However, if using RAW, the 16 bit option becomes available. What is the advantage? A 16 bit file contains a greater amount of colour and tonal information - 32,769 colours compared to 256 of an 8 bit file. In reality though, most of this advantage will be restricted because of the limitation of the colour gamut and therefore a 16 bit file cannot display any more colours than an 8 bit file. Why use a 16 bit file then? The big advantage of using a 16 bit file is if you want to manipulate it. A 16 bit file can be manipulated to a greater degree without the colours and tones degrading or blocking. The resulting image will have smother tones and better graduations. 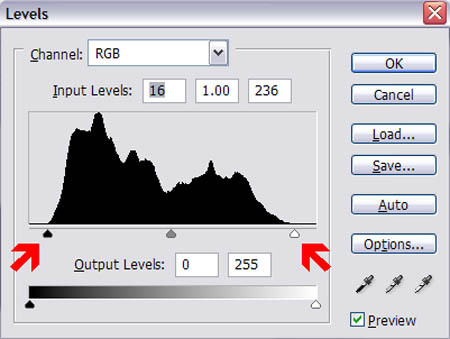 It is possible to tell if tonal and colour information has been lost during manipulation by looking at the histogram – it will display a comb effect showing gaps in the information. To Summarize – an 8 bit / JPEG file will be fine if you don't intend to carry out any major manipulation on it. However, the best option will be to capture in 16 bit / RAW if you intend to carry out a high degree of manipulation. Most digital cameras have the option to select a working Colour Space. The choice is between sRGB, which is normally always the default, and Adobe RGB. If you want to get the best from your camera it is recommended that the Adobe RGB Colour Space is used. This is because it supports a larger colour range (gamut) especially in the cyan to green range of the spectrum. With the camera set to Adobe RGB, it is also important to use this Colour Space in Photoshop as well - see my June 2008 Monthly Photo Tip. When I first open up an image in Photoshop I give myself 15 minutes to check to see if it is worth taking any further. I check the sharpness by examining it at 100% image size. Then, in Levels, I make sure it has both shadow and highlight detail (see my December 2007 Photo Tip below). I also adjust the Curves and Colour to confirm I can get them working how I want. If the image passes all of these tests I will spend more time on it - if not it heads for the Recycle Bin! Even if you rely on your camera's metering system to work out the exposure for you, it is still worth remembering the Sunny 16 Rule. This will give an idea of what settings the camera will be using and therefore what ISO to set. Therefore, using this rule with a digital camera, if it is overcast but still bright and a fast shutter speed is needed to freeze the action - set the ISO to 400, the shutter speed to 1/500s and the aperture to give the correct exposure will be F8. There is a wide variety of papers available now including: resin coated inkjet papers, fiber based papers that have the quality and feel of traditional darkroom papers and art papers which have the characteristics of an artists watercolour paper. Try using a paper that is suited to the image: resin coated paper for your contemporary images, fiber based papers for monochrome work and art papers for an impressionistic feel. Using a ICC profile, see my April photo tip, it is possible to use different papers and still achieve an accurate colour balance between them. Once the screen has been calibrated (see my February and March tips), do you want your print to match it? If you do then the next stage in colour management is to print using an ICC Profile. Described simply, an ICC Profile is a code that will enable the correct colours to be printed with a particular paper, ink and printer combination. PermaJet are one paper manufacturer that provides ICC Profiles for all their papers - PermaJet is the paper I use myself. Their website gives further details on how to use them. See my Links page for the PermaJet website. If you don't want the expense of buying a Spyder, there is an easy way to check the brightness of your screen using a camera. Along with colour balance and contrast, the brightness plays a major part in how images are displayed on a screen. In Photoshop create a new white (R255 G255 B255) A4 document in landscape format and make it as large as possible on the screen. Now using your camera in aperture priority mode, set it to an ISO of 100 and a shutter speed of 1/15s. Now point it at the screen so that the white area fills the frame. If the brightness is correct the aperture should read F8. If it doesn't adjust the brightness of the screen: if the aperture is higher than F8 the screen is too bright - if lower too dim. Remember that the ambient light in the room will make a big difference to how the screen looks. Therefore it is always best to keep the ambient light as low as possible when working at the screen and carrying out this test. A calibrated monitor is the starting point for reproducing colours and tones accurately (colour management). Having a calibrated monitor will enable you to evaluate how the image will appear when it is displayed on another device or printed out. The best way to calibrate a monitor is to use one of the calibration aids, e.g. Datacolor Spyder, available. The initial expense will soon be regained in the time and money saved when prints match what is on the monitor. When using the Marquee tool and holding down the "Shift" key with the Rectangular or Elliptical options will enable a perfect square or circle to be maintained. By holding down the "Ctrl" key when using the Crop tool it will be possible to crop close to the edge of the image without the tool snapping to the document bounds. When moving a selection or layer from one image and it needs to be in the centre of the new one; just hold down the "Shift" key while making the move. Do I need the full Photoshop or will Elements do what I want is a frequently asked question. Without a doubt Photoshop is the best image manipulation package available and is a must for anyone working in the industry. It is well supported with the various plug-ins and how to use guides available. However, the price can be too much for the casual user. Elements is a simplified version available at a fraction of the cost of the full Photoshop. It is still a very powerful program but lacks certain features - most of which will only be used by designers. The main missing features which are useful to the enthusiast photographer are: Channels, Curves and Layer Masks. However, there is a version of Curves available from Elements 5 - see my Photo Tip Number 24. Therefore if you want the best go for the full Photoshop, or if you want the best value for money then Elements is for you. After working on an image in Photoshop, it is often wise to come back to it another day before deciding that you have made the best of it. Just like trying to proof read your own writing after it has been written: it is normally much harder to spot any errors. But by coming back to it afresh it is much easier to see any imperfections or change anything which, on reflection, can be improved on. The same goes for images as well and by doing this you will come closer to making the best of them. 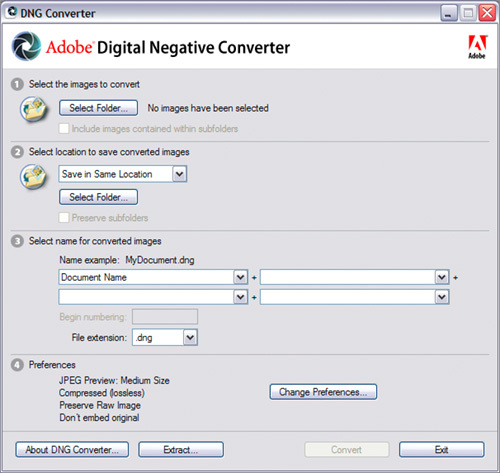 If you are using an older version of Photoshop that does not support the Raw files from your latest Digital Camera, it is possible to download the Adobe Digital Negative Converter which will convert them into a .dng file that will be supported. You will also find a full list of supported cameras and instructions on how to use it. Rather than taking the first shot you see - take time to explore the situation. It's all too easy to take the first shot you see when you walk up to a new subject - certainly take the picture if the situation or light is going to change - otherwise take time to explore the situation to get the best shot possible. Are you using the correct Colour Settings in Photoshop? The Colour Settings are important because they determine the range of colours that will be reproduced in the final output. Images to be printed should be produced in the Adobe RGB (1998) Work Space as it will provide a wide range of colours. Whereas, images that will be used on the web or digitally projected should be produced in the sRGB IEC61966-2.1 Work Space as this reflects the more limited range of colours which can be produced by a computer monitor or digital projector. 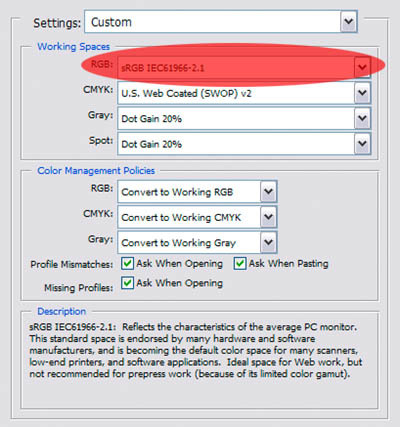 Then in Working Spaces Select the required RGB setting from the drop down menu. Under Colour Management Policies, in RGB check that Convert to Working RGB is selected. If the Profile Mismatches and Missing Profiles boxes are ticked you will then get a warning if there is a profile mismatch when opening up an image. With a digital camera, to help preserve the details in the highlights, I underexpose by either .3 or .7 of a stop or sometimes slightly more depending on the contrast of the scene - the more the contrast the more the degree of underexposure. The resulting images will be on the dark side, but the mid-tones and shadows are easily corrected by adjusting the "levels" in Photoshop. This technique can be used with any digital camera, because digital cameras are much better at handling the shadows than they are the highlights, and once the highlight details have been lost it is impossible to bring them back. 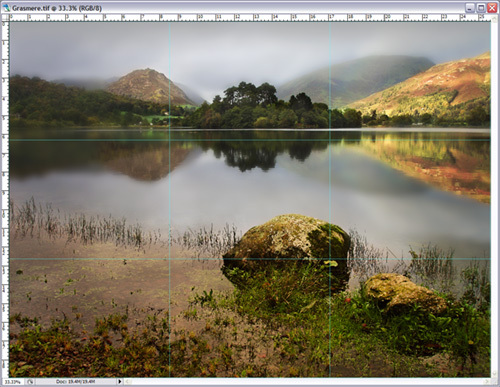 The grid in Photoshop can be set up to give a useful "Rule of Thirds" Grid to check the composition of your images. Photoshop has a very useful Notes Tool. By using it you will never forget how something was done. But, by backing-up the data on your hard drive on to an external hard drive and keeping it separate from your main computer, preferably in a fire safe, the risk will be kept to a minimum. Just hold down the "Alt" key while adjusting the highlight and shadow sliders in Photoshop's levels.